A fax machine is certainly not high on your list when you travel by RV, but once in a while there is a need to send or receive faxes. We use the Internet for everything else, why not faxing? Even if you do travel with an all-in-one printer/fax machine, most of them will need a cable from a land-line telephone in order to work. Read on and we’ll tell you about a couple of websites that we use for faxing – one for receiving and another for sending. Receiving is easier than sending. All that is required is a phone number that receives the faxed document and redirects it as an attachment to an email. We’ve used eFax.com for many years and have had no problem with our grand total of about 3 faxes per year! Here’s how it works. You sign up for a free account. You will be assigned a fax number. Now you can give that number when anyone wants to send you a fax. To them it’s just like sending to any other regular old fax number, but to you it looks like an attachment to an email. Is it really Free? If you go to efax.com you will see an eFax Plus for $16.95/mo and an eFax Pro for 19.95/mo. There is a free version, honest! You need to browse to www.efax.com/efax-free in order to sign up. With the free version you can’t choose your phone number, and you’re limited to receiving no more than 10 faxes/month. You can’t send faxes with eFax free. It’s not worth it to me to spend $16.95/mo with efax to be able to send faxes, so when I need it, I use a different free service: FaxZero.com. 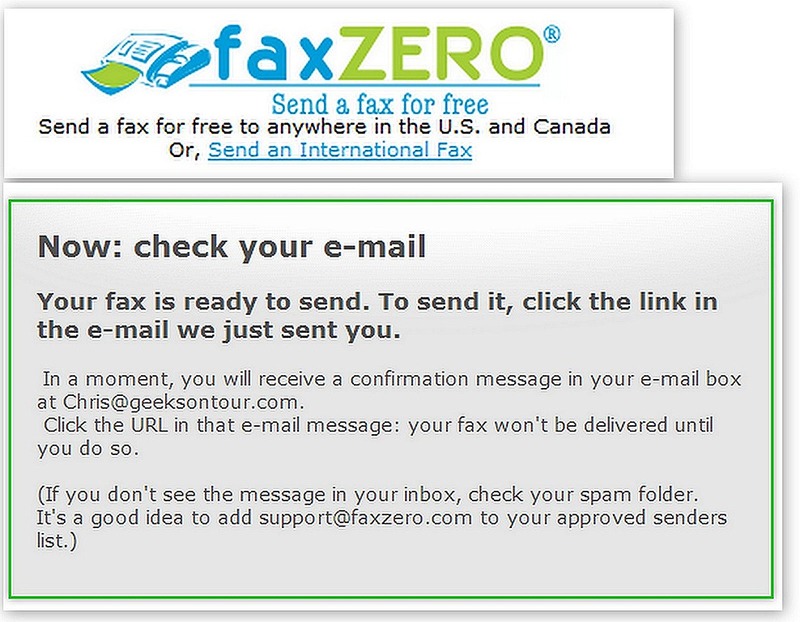 To use the free fax-sending service of FaxZero, you don’t even need to sign up for an account! You just fill out the form with the name and the email of the sender (you) and the name and fax number of the receiver. You can then type a note for the cover sheet and upload a document to be sent. FaxZero will send an email to the address given for the sender. When you see that email and click the confirmation, your fax will be sent. You will receive another email to confirm that the fax was sent successfully. The free faxzero is limited to faxes no more than 3 pages plus cover, and no more than 5 faxes/day. If the document you need to fax is a physical piece of paper, then we have another step. This is often the case because if it was on your computer – then you’d probably just email it in the first place! Usually it’s a contract or a tax form that needed your signature. If you have a printer/scanner, then you’re all set. Just scan the paper, now you have a document on your computer that you can upload and fax with FaxZero. But, what if you don’t have a scanner? In a pinch, I take a photo of the document, but FaxZero specifies that the uploaded file must be a .doc, .docx, or .pdf. Well, ok, if you insist … what I do now is open up my word processing program and Insert Picture, specifying the picture of the paper I just took. Now I have a document file! I might even use Word’s ability to Save As a .pdf file to make it smaller and more efficient. Of course, if you’re at an RV park with a Fax machine in the office – that’s probably easier! What about you? Do you ever need to send or receive faxes when you travel? How do you do it? Published by MrsGeek, in Blog. Tagged with receive faxes with internet, send faxes with internet, send or receive faxes while traveling. Great idea! I knew there was a way to send/receive Faxes for free. I could just never put it all together. Thanks for all of your tips! Great post! Wish we were full time, but still working. Have long wanted a way to be able to fax from RV using internet. Had researched many options and found METRO FAX. Paying under $8.00 a month and can send/receive up to 500 faxes a month. Receive a text message when I receive a fax and of course an e-mail. Open the e-mail and there is a PDF of my received fax. I love it!